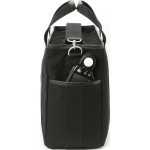 COV-7500N is a black camera bag that can easily be converted into an everyday tote. With a simple, understated appearance, it appeals to both male and female photographers seeking minimalistic style. 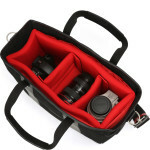 Designed to hold a medium-sized DSLR, three lenses, and a laptop of up to 15”, this tote style bag protects and organises your gear. With a customisable design and strong, water-resistant exterior, it’s a versatile companion for days on set and off. 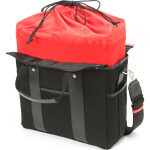 Customise the removable interior basket with three adjustable dividers, using the drawstring closure to keep your gear safe inside. 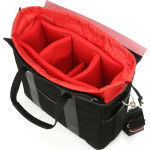 Store your laptop in the dedicated compartment, with a touch-strap to hold it firm on the move. Organise your everyday essentials with the interior and exterior slip pockets, or use the zipped internal pocket for secure storage. 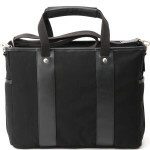 This black nylon, leather and number 6 canvas bag is weather- and stain-resistant, designed to withstand wear and tear. 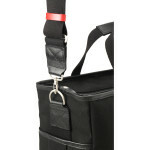 Wear across your body with the removable shoulder strap, or use the two grab handles to carry over your arm. COV-7500N is a perfect compromise for photographers looking to balance functionality and style. With flexible design and a smart, black exterior suitable for any occasion, it’s an ideal alternative to bulky camera bags. 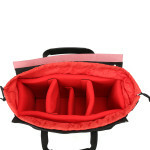 The padded camera basket has three touch-pad dividers, allowing you to organise your DSLR and up to three lenses. 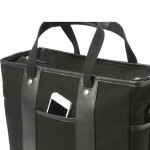 Secure using the drawstring, and instantly transform your bag into an everyday tote by removing. 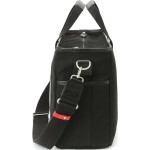 A dedicated pouch accommodates a laptop of up to 15”, whilst the zipped pocket holds small personal items. 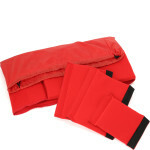 Organise your accessories in the two interior and dual side pockets, and slot your phone into the front slip-pouch. 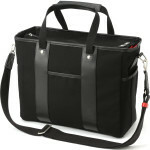 With zipped access to the main compartment, a weather-resistant exterior, and studs to elevate your bag off the floor, this tote is designed to protect your gear on the move. Made from nylon, leather and number 6 canvas, this camera bag is constructed to meet the challenges of the modern photographer’s lifestyle. Durable and hard-wearing, its stain-resistant and weather-resistant properties give you peace of mind when carrying your equipment. 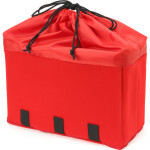 Protected by a two-year manufacturer’s warranty, it’s a quality investment for your camera gear. 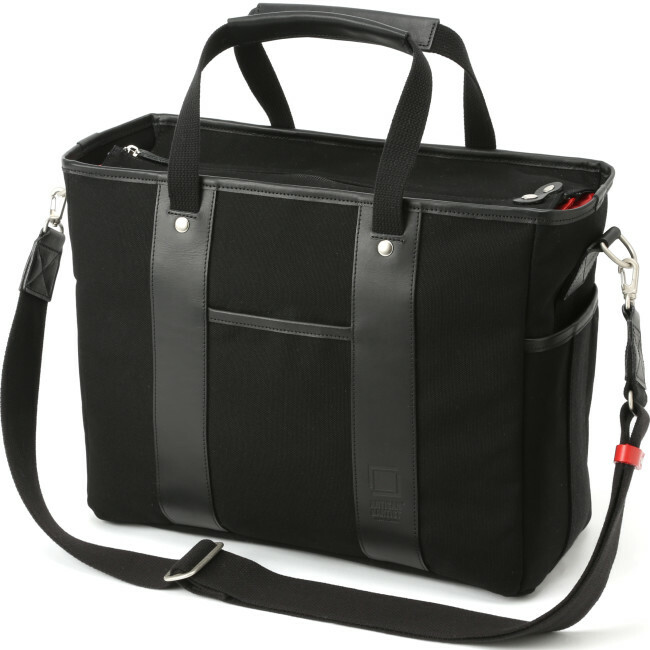 Artisan&Artist is a Japanese brand that uses the finest materials and traditional craftsmanship to create premium camera bags for photographers worldwide. 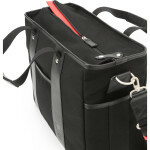 Putting functionality first, their simple and elegant designs have widespread appeal in the industry, renowned for their discreet appearance and high quality.